Stick the ear buds in your auricle and let the beat drop during your exercise routine, your commute, or anywhere you want to enjoy your tunes. Thanks to the adjustable earhooks, the earphones sit completely comfortable in your ear and provide you with the same secure feeling that only your favorite feel-good song can give you. Don't you worry about ruining your earphones in the rain or with sweat. The seal-proof design makes it hard for sweat and rain to penetrate the headphones and nano coating provides IPX6 waterproofness. No matter how extensive your playlist may be, we gotchu covered. 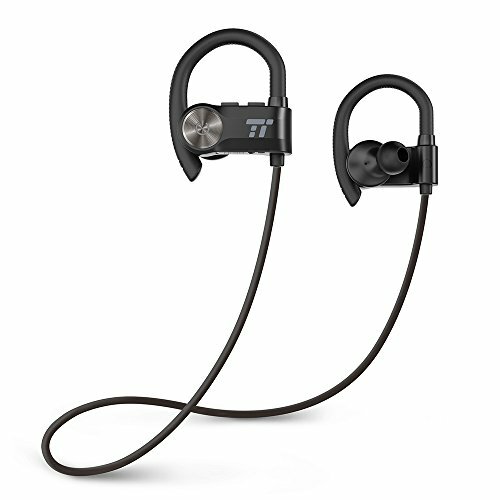 The earphones won't run out of juice for a whole 8 hours thanks to the energy-efficient Bluetooth 4.2 technology and the built in 120ma battery. Your music won't skip a beat thanks to the CSR8645 chip that provides the TT-BH024 earphones with AptX lossless sound. Feel every beat of your favorite song and enjoy the high fidelity sound. No more "Hello?? Can you hear me?? Barbara??" thanks to the CVC 6.0 noise cancellation technology. Hear everything single word Barbara has to tell you and be free from static, white noise, and other disruptive sound factors.